I have to date only briefly flirted with Scottish Independence and the 2014 referendum, later on in the year. However this dreadful and in my view childish Aberdeen jamboree by both men I find an expensively distasteful moment in the whole sorry saga. It is also a rare glimpse into the psyche of modern political minds and the cult of celebrity. We have a podgy but wannabee cuddly Alex and the rapidly middle ageing PR consultant and unelected Dave, both desperately wanting to be loved. Something I feel will not easily be their fate as the drama unfolds. Or more accurately the soap opera. The latter a more apt comparison, given the audience to which it is aimed at. In essence both men are the proverbial "two cheeks...." Both make claim to North Sea riches, long spent by the Westminster Governments of the last four decades plus. A central UK government dominated by Socialist and Scottish underpinning, happy to use these riches to pay for their gerrymandering mass immigration policies and to try and buy elections for their own ends. It is also ironic how both the SNP and Salmond believe independence would give them a place in the Brussels led Federal States of Europe and how Camoron believes holding onto The UK allows him greater powers. 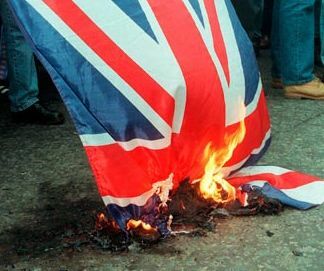 Powers as long sold out to the EUSSR as The British people were sold out to the political classes on North Sea riches. You would never believe that The UK was ever an oil rich State, would you? Yet few ever ponder that issue or fact. Now Norway's wealth and nurturing of its people through prudence and investment of oil riches is a joy to consider. Albeit their political classes are now looking to mass immigration to waste that sensible savings policy of the past. Our Podgy Alex is correct in comparing Norway's prudence with our lot's wasteful profligacy but he should realise that the wealth available, though great, in the North Sea fields' reserves is much harder to recover and a great deal less than that of the 1970's liquid gold rush. So "Call Me Dave's" assertion that investment need is colossal also has a ring of truth. Of course the same oil giants. who would underpin exploration, would care little with whom they have to do deals. Only the price to paid for bribes licences. So I rather feel that the posturing is rather typical of all our politicians today and none of them offer any real options for a better future. Salmond does appear to be a breath of fresh air and like many other aspects of the campaign, runs rings round a guy who supposedly is meant to have some experience in PR. Whatever, Salmond's girth and smug "hail well met" public face just mask his real and so common purpose reality of modern political arenas. That is to say greed. Not just for personal wealth but power, legacy and to be well beloved. Funny if not so damagingly pathetic, for most of us. Finally, on the matter of Independence. If that meant we, here in England, would lose the stifling and corrupt dominance of a socialist Labour Party of bullies and Trade Union run, left wing, millionaires, now that would be wonderful. Nevertheless, I would happily support a United Kingdom free from the yolk of the ever more discredited and corrupt EUSSR. never simple, is it?